A burglar knows that virtually all web sites suggest to install the wireless door alarm up high and that most door chains are installed just above the door handle. So when a nearby window is smashed it is easy for the intruder to unhook the chain and turn off the door alarm. He will most likely not notice the low placed alarm and chain lock till the alarm goes off and the door won't open all the way. 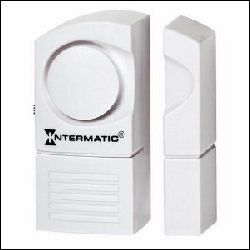 This is one of the most economical door security devices available for residential use. First of all the door alarm will scare away any would be burglar and secondly the device is used frequently to be alerted when someone is trying to leave the house. That someone could be a young child or an older person suffering from dementia. As soon as the door is opened a piercing alarm is sounded. The door alarm will shut off as soon as the door is closed. Depending on the brand name, the sound is anywhere from 90 to 120 decibels. Most alarms have a low battery test button and light as well as an on/off switch which is handy so it can be activated only when needed. Wireless door alarms require two to three batteries to operate. No tools are required! The wireless door alarm is easy to install with peel off double sided adhesive tape. The larger part (the alarm) is mounted on the door and the other part (the sensor) to the casing. It is important to align the two arrows, or any other type of markings, on the alarm. Also the two parts should be no more than 1/2" (12 mm) apart. High at the top of the door if the wireless alarm is intended to warn you of a child or older person attempting to leave the house. Low and close to the floor if the door alarm is intended to scare intruders away. In addition to the wireless door alarm you should also install a door chain lock close to the bottom of the door. If the unit comes with a warning sticker place it in a prominent way. Most small time burglars will move on to the next house as they do not know what kind of alarm you have installed. If the unit does not come with a warning sticker, buy one. This type of alarm should also be installed on all ground level windows.